The Salvation Army is blessed with many inspired songs that remind us of our mission to save souls, grow saints, and serve suffering humanity. The General’s call for the entire worldwide Army to get out of our corps buildings and into our communities has resulted in a mobilization of loving service and evangelism all around the world. The Whole World Mobilizing campaign has been fueled primarily by prayer, scripture, and song. These songs, often contained within the pages of The Salvation Army Song Book propel us forward into mission and inspire new generations of Salvationists to mobilize for Jesus. 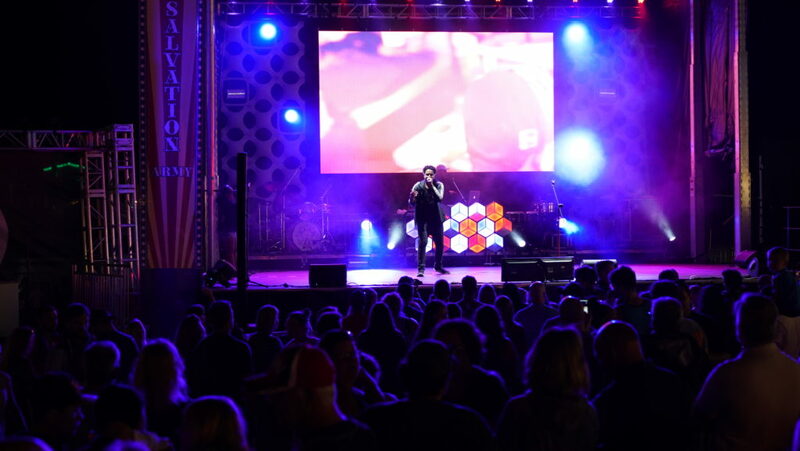 The new song, Rally Up, has its roots in the very best tradition of Salvation Army war songs, yet is given a contemporary rebirth through the medium of hip hop. Amazingly, on July 18 of this year, Nielsen Music announced that for the first time in American music history, hip hop is the most consumed music genre in the US, surpassing the popularity of rock and pop. Like William Booth’s insistence that Salvation Army hymns be set to the popular media of the day (dance hall ballads and tavern folk music) we are similarly presented with an incredible opportunity to reach the present generation through Gospel themed hip hop, rap, and R&B. Rally Up is based on the song written by Salvationist composer William James Pearson (1832-92), “All Round the World the Army Chariot Rolls”. Though its original tune is unfamiliar to many, the words are a powerful reminder of our mission. From these stirring lyrics, Rally Up was born. Christian songwriter Rell, an emerging hip hop artist from South Florida was tasked to bring the song to life with fresh words and new rhythms. Spoken through the idiom of hip hop, Rell adapted Pearson’s verses and powerfully transformed them. I’m energized because they criticize my brothers when we fantasize about a holy enterprise. I’m just ready for the return of the One. Father Spirit and Son, never ready to run. I ain’t living till we live again, rally up the army we marching. Around the world the Chariot rolls. Around the world the Lord is saving souls, my people be brave. Spread around the globe on the road don’t play, spread around the road on the globe everyday. Rell and DJ Morph performing “Rally Up” at the 2017 OOB Pier Festival. The song was then recorded and produced by DJ Morph and performed to great acclaim, with choreography and dance provided by Army On Its Toes, at the 2017 Commissioning for the USA Eastern Territory. It was then made into a compelling music video, first aired at the 2017 Old Orchard Beach Pier Festival. The video, shot among the familiar streetscapes of New York City has an international flair, showing The Salvation Army mobilizing all around the world, in both the past and the present. Rally Up is indeed a war cry for the past, present and future generation of Salvationists. Its electrifying chorus drives those who hear it to their feet, reminding us that to live out our mission as Salvationists we need to rally together in unity, ask the Lord to equip us, and send us out into our communities to share the Good News of Salvation. Rob Jeffery joined the Salvation Factory team in 2015 as the Resource Innovator. He holds a Master of Divinity from the Atlantic School of Theology and soldiers at The Salvation Army Spring Valley Corps, Greater New York Division. He is married to Samantha and has three children.